IOI 2012 took place this year from 23rd to 30th of September. I was lucky enough to be chosen to represent Ireland, as part of the four-person team. 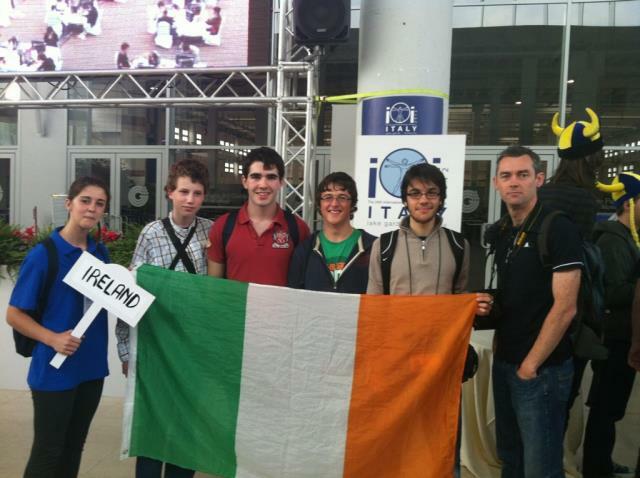 Ireland chooses their team from the top contestants of the AIPO, in which I came fourth. The Olympiad was challenging to say the least, none of my team got a medal, but considering it was everyone's first time (even our leaders) at an IOI, we didn't mind too much. The tasks were interesting, and all of the security around the competition was bizarre. It was by far the largest, and most serious, competition I have ever entered in my life, so the idea of quarantine was strange to me, this was when the leaders had to translate tasks, so we were banned from internet, phones and leaving our house! bus-boat-things, by my team-mate Maciej. The week itself was amazing. When the competition wasn't running, we travel to Venice, Gardaland and see around Sirmione, on Lake Garda. The food was delicious, though our Italian guides were used to it and couldn't get over how much we ate. I've never heard of vodka pasta , chips on a pizza, or had swordfish before, but Italian food is gorgeous. Just like the president of the IOI committee said in his speeches, the best thing about being at the IOI is meeting people. I've never met so many people from so many cultures and countries, who I've also had so much in common with. Between the guides, who were all Italian students our age, and the contestants, we had a laugh, there was a concert, parties and just everyone having fun. Little Talks and Gangnam Style were definitely the songs of this IOI. The last day was pretty glum to say the least. With almost every one gone by the time we got up, we were one of the last teams to leave the Garda Village, our home for the week. Of course, we were only sad because this incredible week was over. All I can say looking back, is that it was definitely one of the best weeks of my life and I hope I get to go again, at IOI 2013, in Brisbane, Australia.